Unit fixing bolt set for JBL4320,4331,4333 from JAPAN F/S. It is a steel bolt similar to JBL genuine, black plating finish. Set content · Tweeter & blank panel x 16 · For squawker × 8 · For woofer × 8. Please let me know if you have any questions. Also, please tell me if you have what you're looking for in Japan items. 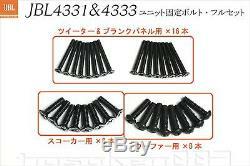 The item "Unit fixing bolt set for JBL4320,4331,4333 from JAPAN F/S" is in sale since Monday, August 14, 2017. This item is in the category "Musical Instruments & Gear\Pro Audio Equipment\Other Pro Audio Equipment".